I received product for review from Nonni's. The opinions within this post are of my own and I was not influenced in any way. Please do your own research before purchasing products or using services. Your opinions and results may differ. 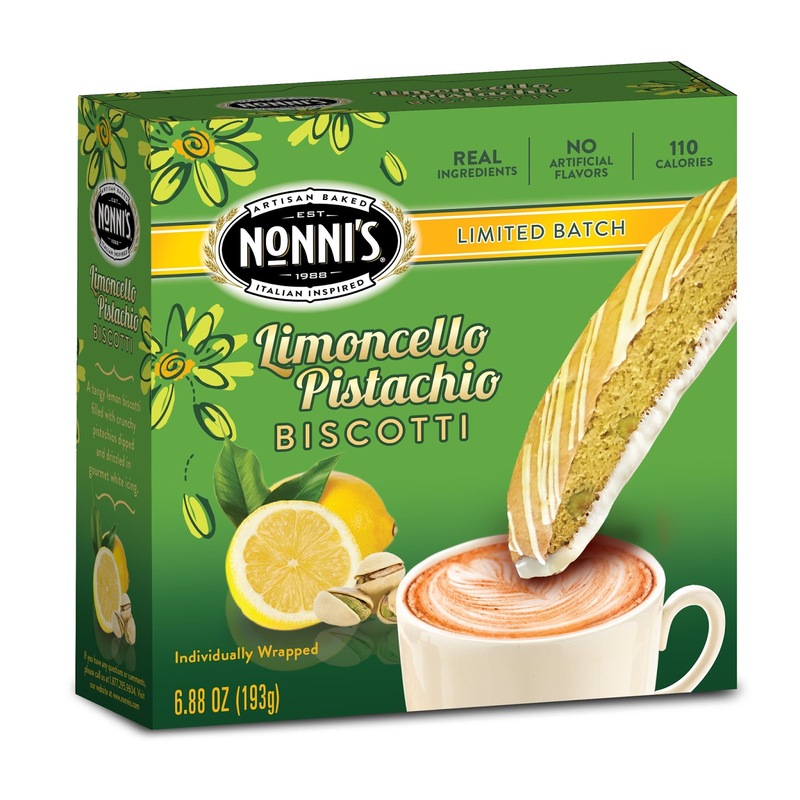 Nonni's, the leading premium biscotti baker, has introduced two new limited-edition spring flavors - Limonette Pistachio and White Chocolate Cherry. Both hit grocery stores nationwide in March, and are available for a limited time. An ideal companion to a morning latte or late afternoon hot cocoa, each light and crunchy cookie is made with high-quality, real ingredients and are 110 calories each. They can be enjoyed as an indulgent snack or post-dinner dessert. Having become familiar with Nonni's Biscotti a couple years ago, I now consider the gourmet dunking cookies to be a tasty sweet snack. Biscotti are crisp, rectangular cookies and have a dry, crunchy taste and texture. The added ingredients of pistachios, cherries, icing, and other ingredients give extra tasty flavor in each bite. There are eight Biscotti cookies in each package, and they are individually wrapped for freshness. Although people tend to dip their biscotti in coffee or hot tea, I tend to eat them alone. Both of the new flavors are yummy. The Limoncello Pistachio Biscotti is my favorite of any Nonni's Biscotti I've tasted before. My favorite time to eat Nonni's Biscotti is when I'm at work and craving a snack. Because they're not high in calories, I don't feel guilty about eating them and they satisfy my cravings. 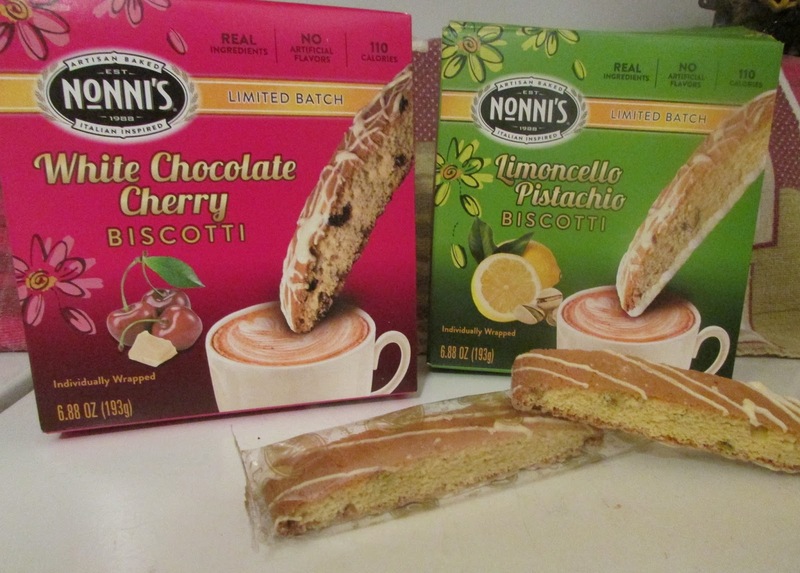 One person will win one box each of Nonni's Limited Edition Spring Biscotti flavors. I want to try the White Chocolate Cherry. Either one should be good but this one sound delicious. I would love to try the white chocolate cherry but would love them both . I am very excited to try Limoncello Pistachio but would enjoy both. I want to try White Chocolate Cherry first. Limoncello Pistachio sounds great to me. I happen to have enjoyed all their flavors so far though. White Chocolate Cherry sounds so good. the white chocolate cherry sounds really good. i can't wait to try both of them. The White Chocolate Cherry flavor sounds delicious. I'm excited about the White Chocolate Cherry. Sounds yummy! I'm most excited to try Limoncello Pistachio first. I like the way it sounds! Both these flavors sound great. I think my favorite would be White Chocolate Cherry. Oh boy, they both sounds really good! I would have to choose the Limonette Pistachio that I'm most excited about. Limoncello Pistachio would be my first choice! Limoncello Pistachio sounds and looks delicious! I would love the white chocolate cherry dipped in tea! It would definitely be Limoncello Pistachio!! Limoncello Pistachio is what I want to try. Sounds great paired with my tea! I would love to try Limonette Pistachio flavor first! Both flavors sound delicious. I'd like to try the Limoncello Pistachio first. Would like to try the white chocolate cherry. White chocolate cherry hands down! Limoncello Pistachio is my first choice! I am usually a chocolate nut, but the limoncello pistachio sounds so refreshing!! I'm anxious to try the White Chocolate Cherry - love anything with white chocolate! I would love to try the white chocolate cherry! I'm most excited for the White Chocolate Cherry. I would like to try Limoncello Pistachio. The limoncello pistachio sounds best to me, but both flavors sound delicious. Both flavors sound great but I've been really liking lemon lately so I would go with the Limonette Pistachio flavor to try first. I would have to say the White Chocolate Cherry for sure! It sounds so yummy. They both sound good...but especially the Limoncello Pistachio! I want to try the Limoncello Pistachio. Limoncello Pistachio Biscotti sounds awesome! I'm excited for white chocolate cherry! YUM! I am most excited to try the Limoncello Pistachio. I'm excited and ready to taste the White Chocolate Cherry. I love Nonni's! White Chocolate Cherry. I love chocolate. I would love the Limoncello Pistachio. I am most interested in the white chocolate cherry variety, especially dipped in chocolate milk. I would love to try their White Chocolate Cherry....sounds tasty! Roough choice but I would probably go for the white chocolate cherry first. The Limoncello Pistachio sounds delicious!! I'm a chocolate lover so the white chocolate cherry is a no brainer. yumm, they all sound great! I want to try the white chocolate cherry. I would like to try the Limoncello Pistachio. The white chocolate cherry flavor sounds super delicious. Yum!!! I would like to try white chocolate cherry. Ooj, no doubt the white chocolate cherry for me. Sounds soooo great. I want to Limoncello Pistachio . Yummy. I would like to try the White Chocolate Cherry flavor first. I would love to try the Limoncello Pistachio. I think they both sound good, but I'd like try Limoncello Pistachio. I'm excited to try the Limoncello Pistachio. the white chocolate cherry sound great. Both flavors sound wonderful--at the moment, I'd try Limoncello Pistachio first. Thank you for the giveaway! I would like to try the White Chocolate Cherry flavor the most. White Chocolate Cherry is my choice. I can imagine how great they smell and look forward to the taste....YUM! I most want to try the White Chocolate Cherry. I am most excite to try the White Chocolate Cherry. I want to try the White Chocolate Cherry and the Limoncello Pistachio.